If you have read the Float white paper, The Rise of Work-based Performance Support Systems in the Digital Age, and the subsequent series of blog posts, you already know the stark truth: you need to provide performance support solutions to your workforce or ignore it at your own peril. On-the-job employees are looking for information that helps them do their jobs better with multiple devices. They are seeking ways to answer questions and solve problems in the same way they do it in everyday life – by reaching for their mobile devices and selecting the right tool for the job. Any other antiquated way – massive information repository websites, “next button” training modules, voluminous unsearchable PDF files, black hole SharePoint sites, and print (yes, print) – will quickly make them reach for the close or delete button or throw the product bulletin binder in the back seat. If you need more convincing, there are five potential enjoys a WPSS that are outlined in the white paper. Let’s take a deeper dive into each one. It wasn’t long ago that we used to say a company was making a good impression on a new employee when they delivered information on mobile devices. There was tech credibility going on. Now the delivery to the employee smartphone or tablet is expected. In a 2015 report, Pew Research Center shared that 7% of Americans are completely “smartphone dependent.” In other words, the smartphone is practically the only way they access the internet. No broadband at home and few alternatives to get online other than the small screen device in their hand. The device dependent audience will only grow. To meet the demands and expectations of the workforce, companies will have no choice but to go mobile – and to do it smartly. A company might think it is saving money by sticking with outdated delivery channels, but the costs of a resistant audience and potential knowledge gaps for job performance can have an even greater financial impact. Deploying useful information to the users at the time of need will go a long way to supporting happy employees who want to stay with the company that “gets” them. It can be true that sometimes the upfront costs of a mobile deliverable is greater than the existing solution. But, a sound mobile strategy can result in eventual, if not immediate, cost savings. Take the issue of onboarding. There might be instructor-led training in place, eLearning modules in the LMS available, and some PDFs tucked away in a company server that Magellan would have trouble discovering. Why not bring those onboarding assets, or at least links to them, all together in a mobile application so the new employee can be guided through all of the steps and even check the tasks off in a digital checklist? With a sound design on a secure security framework, the employee saves time, perhaps travel costs (by doing the ILT online) and updates to the information should be potentially much easier. And the company sets a precedent with the employee that they care about their career path. There is the old saying, “live and learn,” which espouses a learn-from-your-mistakes type of mentality. But wouldn’t it be better if the employee made little or no mistakes at all? This is one of the core strengths of mobile performance support. Delivering the right information at the time of need results in the user doing the correct behavior consistently (assuming, of course, the user is good at following instructions). Consider a technician doing a safety inspection on a vehicle. The technician could learn the steps in an online course, and then go to a vehicle and try to recall the steps. Or, the steps could be clearly explained in a well-designed and interactive application that uses voice recognition and is used while the technician does the inspection. That’s the result of the Vocollect with Voice product from Honeywell. Not only is the technician receiving information specific to the vehicle right in front of him but the device allows him to receive it hands free so he can execute each step as he does them. This method can be used to equip the employee to do their daily job tasks, can be used as reinforcement training, and could even be used as the initial training guiding the technician through each step even on a type of vehicle they have never seen before. We all know that security breaches grab the headlines. When a big brand gets hacked and loses all sorts of confidential information, it can be unnerving. But, truthfully, the amount of confidential information that gets passed to and from mobile devices everyday is overwhelming. Patient records, financial information, proprietary government content, enterprise intellectual property, and more are all being passed back and forth even as you read this sentence. Have you paid a bill with your smartphone lately? You are proving the high success rate of mobile security. Encryption, user and device authentication, configurable device settings can all play a part in mobile security. And there is a host of mobile device management (MDM) and enterprise mobility management products from trusted names like Citrix, IBM, Microsoft, AirWatch, Apperian, and MobileIron that give companies comprehensive control options over the devices and the content. The mobile platform may the most secure method of delivery that has ever existed. Let’s go back to our technician doing the vehicle inspections. We can build a business case scenario to show how mobile delivery can have a positive impact on performance. This is a fictitious scenario, but you will get the idea. In 2013, the Acme Vehicle Inspection Company conducted 10,000 inspections and had an enterprise-wide 5.75% error rate. After installing the mobile solution mid-way through 2014, they were able to reduce the inspection error rate to 4.5% in 2015. In fact, because of the pace and efficiency directed by the mobile application and hands-free system, the company was able to increase the number of inspections per day across the enterprise. This example shows how a performance improvement case can be made that utilizes existing metrics such as cost per error and profit per inspection. Reducing errors and boosting profits are always a good story. The Pew Research Center report I referenced earlier found that more than 80% of American adults ages 18-49 have a smartphone. This constitutes an overwhelming majority of the current and upcoming workforce. Retrieving information on a smartphone is the norm, not the exception. Companies should take advantage of this platform to deliver powerful and useful tools to their employees. Those that fall behind because of the usual excuses – “we are too conservative,” “it costs too much,” “it’s a security risk” – will find themselves falling behind the competition. And, the best-qualified workers will be accepting jobs that do offer superior performance support tools. There are many good examples of mobile performance support systems in the enterprise today. Do you use one or have you seen an interesting case study? Share it with the rest of us in the comments. 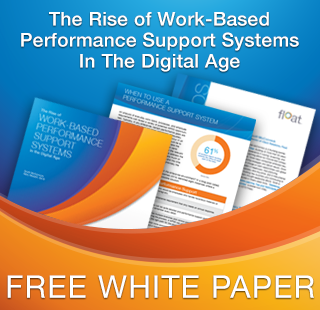 And be sure to download Float’s white paper, The Rise Of Work-Based Performance Support Systems In The Digital Age.